Coppell High School sophomore defender Haley Roberson dribbles up the sideline, looking to pass to sophomore forward Micayla Weathers. The Cowgirls tied Richardson Pearce,1-1, at Buddy Echols Field on Tuesday night. As the horn sounded, cheers filled through the air. One streak was ended, yet another remained intact. 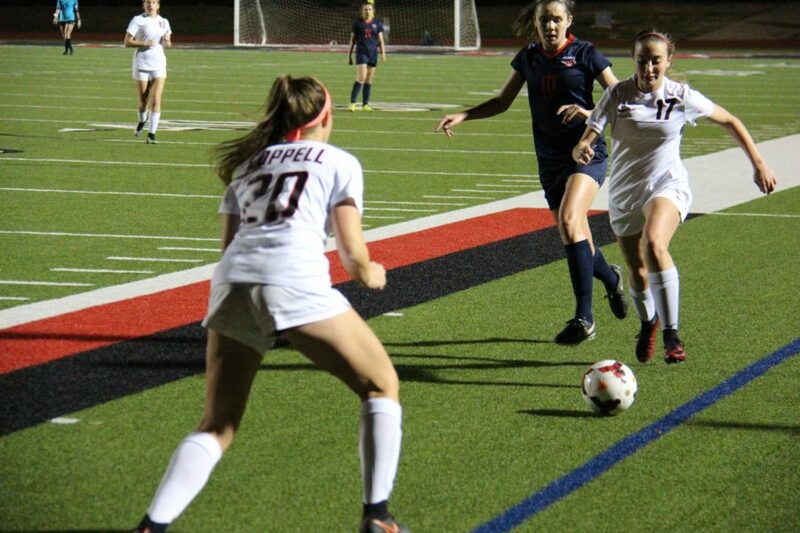 In a 1-1 tie with Richardson Pearce at Buddy Echols Field on Tuesday night, the Coppell girls soccer team allowed its first goal of the season, snapping a 14 match shutout streak. Yet the Cowgirls (13-0-1) keep their unbeaten record intact heading into the final six matches of the regular season. Hux and the Cowgirls put the attack on Pearce early, with Hux scoring on a cross into the box in only the second minute of the match. Throughout the rest of the first half, the Cowgirls kept the pressure on the Mustangs, yet could not come up with another goal. Yet the second half was a different story, especially for Pearce. Early on in the second, the Mustangs held most of the possession on Coppell’s side of the pitch, and put a couple of shots on goal. 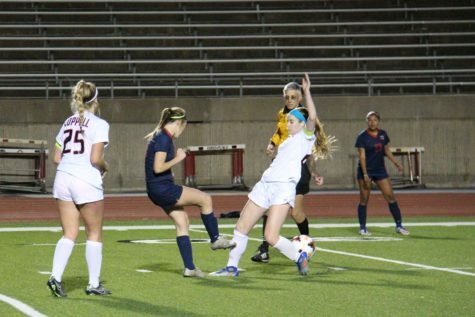 Being held to playing defensively to an attacking team was not a sight that Coppell has seen much of, and 10 minutes into the second half, Pearce squeaked one past senior goalkeeper Maddie Weber to tie the match at one. Coppell High School senior defender Sarah Houchin attempts to steal the ball from a Pearce attacker in the second half of the Cowgirls 1-1 tie to Richardson Pearce at Buddy Echols Field on Tuesday night. Coppell allowed its first goal of the season, yet kept its perfect record. Aside from 1-0 win over Pearce on Jan. 27 earlier in the season, the Cowgirls have only had two one-score matches, 1-0 wins over Byron Nelson and Grapevine. 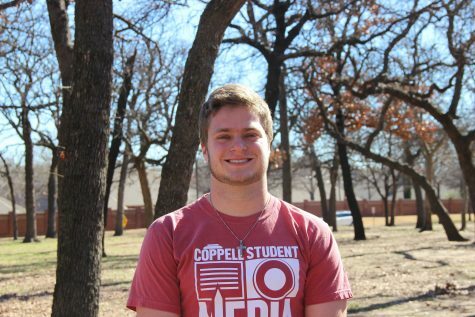 While Coppell was in unfamiliar territory after allowing a goal for the first time of the season as well as having a down-to-the-wire match, Dunlevy thought that the team did well in the situation they were in.